I am writing this post as we travel the roads of Northern Illinois this Sunday from a nice weekend getaway. Since we we be arriving home later in the day, I needed a Sunday dinner where several components could be made in advance to help me when we get home. I caramelized the onions for the appetizer ahead of time. The chicken and vegetables for the main event are prepped and ready to go. For dessert, I poached the pears before leaving. Since I wanted a little crunch along with the pears and créme, I have a batch of gingersnaps stored in the cookie jar ready to be enjoyed and shared with you today. This is a true gingersnap cookie. To the original recipe, I added clove for a little more spice and freshly ground black pepper for a little heat. I also substituted a bit of brown sugar for the white sugar for a slightly deeper flavor. One of the best tips I can give for a good flavor is to use spices that are fresh. Some recipes call for crystallized ginger, but I save that for other ginger cookies that are softer. While they are great to eat as a simple cookie, they are also useful for desserts that call for gingersnaps in the crust or crumble. In a medium bowl, whisk together the flour, baking soda, ginger, cinnamon, clove, pepper, and salt; set aside. In the bowl of a stand mixer fitted with the paddle attachment, cream the shortening and sugars together until light and fluffy, about 2-3 minutes. Add the egg and molasses and beat until combined. Scrape down the sides of the bowl and beat again. Add the flour in three additions and mix until just combined. Cover the bowl with plastic wrap and refrigerate for about an hour to firm. (Dough can be made in advance and refrigerated up to 2 days or frozen for up to 1 month). Preheat the oven to 350º F. Place the 1/3 cup sugar in a shallow bowl. Line a baking sheet with parchment paper; set aside. Using a small ice cream scoop or spoon, shape the mixture into 1-inch balls and roll in the sugar. Place the balls 2-inches apart on the prepared baking sheet. Bake until the tops are rounded and slightly cracked, about 12-15 minutes (12 minutes for a chewier cookie, 15 minutes for a crisp cookie). Allow the cookies to cool on the pan for 2 minutes. Transfer to a wire rack to cool completely. Cookies can be stored in an airtight container for up to a week. Enjoy! I would love to have some of these cookies to crumble and add to my yogurt. I can only imagine how tasty that would be. Thats so funny, Nicole, I was writing my post in the car last night also on the way home from my inlays. 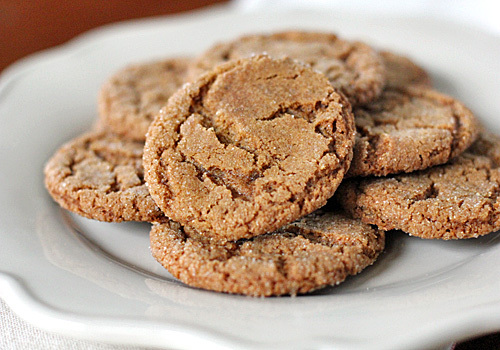 I love ginger cookies, especially if they have a lot of crackles and these fit the bill! YUM! Wow you have so much more willpower than I. Leaving cookies untouched after making them for a later date would never happen at our house! Mmmmm, cookies! I used to love ginger snaps, but haven't had one in years? Why is that? I believe you've inspired me! Thanks. I hope I have:) Growing up, I love d the ones Dad brought home in the bag-- spicy and snappy! I have moved on from the store bought stuff, and I am more than happier with the results! I have glued together two gingersnaps with the orange cream cheese frosting. It was amazing! That sounds delicious:P I am glad you enjoyed the recipe! Thanks for the recipe. I'm going to make these for a friend's birthday this weekend, they are his favorite. You are welcome. I hope your friend enjoys them! He did. They were a hit. Thanks.